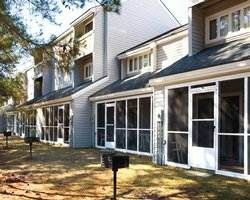 Deercreek offers expansive, comfortably furnished, and fully equipped vacation townhomes in one of the most desirable areas near Myrtle Beach. 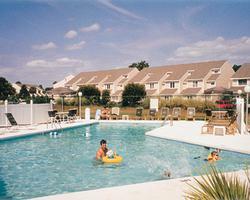 Located in the gated community of Deerfield Plantation, Deercreek is only minutes from the best beaches and activities. Make your vacation even better with these Surfside Beach timeshares for sale. Deercreek’s two, three, and four bedroom townhomes are multi-level with two and three floors. Bedrooms, each with a private bathroom, are upstairs, assuring privacy and quiet for sleeping. The main floor offers a relaxing space for family and friends to get together, with comfortable seating and sliding glass doors that lead to a furnished outdoor living area. A full kitchen is well-appointed with dishwasher, full refrigerator, conventional oven, pots, pans and dishes. An outside grilling area provides another dining option. These timeshares feature three LCD TVs, Cable/Satellite, DVD and Video players, wireless internet, and IPOD/MP3 connectivity. Everyone stays comfortable with ceiling fans, central heating, and air conditioning. All townhomes have a washer and dryer. The serene setting of Deercreek will entice you to stay on the property where there are many activities. Hop on one of the resort’s bicycles for a ride around the lovely area. 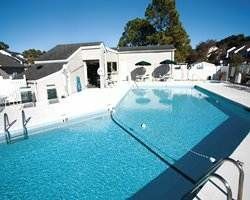 The large outdoor swimming pool is great for swimming laps and features a cabana and Jacuzzi. Children have a wading pool and playground. Several sports courts include two lighted tennis courts. White sand beaches and fishing are less than a mile away. Contact Deercreek (Deerfield Plantation) Specialist Today!